Xinhua, the government-controlled Chinese news agency, published the news at 7:50 p.m. on 16 November that the Chinese Ministry of Health confirmed three cases of human infection with bird flu. The two cases occurred in Hunan Province and one in Anhui Province. The report was very brief and did not provide details of the cases. It is still not clear whether the patients are still alive. The World Health Organization has not confirmed Xinhua's latest news, but at the request of the Chinese government, the organization has already sent a group of experts to Hunan this week to carry out investigations of these confirmed cases. 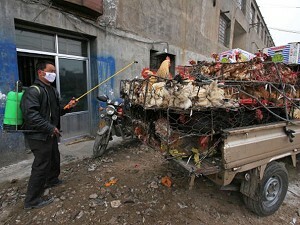 In the past month, China has reported 11 outbreaks of deadly H5N1 strain of bird flu among poultry.